This was my fourth pregnancy. Sadly, two weren’t meant to be, but we were lucky to have Ava, who was then three and a half. So, 30 April 2015 and after 18 months of ‘trying’, there it was . . . a positive. We were thrilled. My first pregnancy ended in an ectopic at 7.2 weeks. Luckily, my tube was saved but we knew that any further pregnancies would require an early scan, and at five weeks I was booked in to Kingston to have one. I was convinced that it was another ectopic as I was in pain on my left side. Imagine our shock and delight when the sonographer pointed out two little blobs on the screen. It was too early to see heart beats, but there they were! After a few days of excitement and anxiety about how we would cope, THE SICKNESS started! I was expecting it as I was very sick with Ava and had been diagnosed with HG. The next ten weeks were the darkest days of my life. It was worse than I ever could have imagined. I was sick up to 50 times per day and was unable to keep anything down, not even water. I became very depressed, and was only lifted by being pumped full of drugs and fluid when I was finally admitted to hospital. By week nine I was at my lowest and unable to care for Ava. The joy of twins was a distant memory. My mum travelled up to London and took me and Ava back to North Devon so that she could look after us whilst my husband was at work. After four days in Devon I was admitted to hospital, where I spent one week. I was discharged with a new drug which helped where nothing else did, and which finally gave me hope that I could get through the HG. Thankfully, by week 21 I was off the medication and felt as good as you can do when carrying multiples. 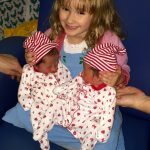 Early in the pregnancy I was told that as I’d had a difficult labour with Ava, and because they were identical twins who shared a placenta, I’d have to have a C-section. I was terrified – this was one of my biggest fears. I had to have counselling in order to try and overcome my anxiety and although this did alleviate things somewhat I was still very worried. I was booked in for delivery at 36 weeks – 9 December. However, thankfully for my sanity, my waters broke at 34 weeks whilst I was at home. It was a Friday evening, around 8:00 pm. Ava had gone to her auntie’s for a sleepover and I was watching an episode of Toast of London with my husband when I laughed… hard. Pop. “Call for a taxi!” I shouted to my husband. He questioned whether I’d just wet myself. I gave him the ‘look’ – you know, the death stare – and he picked up his phone and started dialing. Please note that this was a silly move for which I was later told off: I should have called an ambulance! By 9:00 pm (after the taxi had got lost and I’d had to direct from the back seat) I was at the hospital. Lots of people came in and out of the room into which I’d been put, asking me to sign various forms, and to make sure I understood exactly what the plan was. At 9:30 pm I was in theatre and being given an epidural. I immediately started to feel cold and was then sick. The anesthetist proceeded to update the room on the fact that I’d had chicken fajitas for dinner! They gave me some anti-sickness medication and that helped with the nausea, but not the fear. I was frightened of the first incision, scared that I’d feel it or that the epidural would wear off. I remember telling the anesthetist that as I was having twins, maybe they’d need to give me a double dose. She laughed! The room was very busy, with perhaps 20 or 30 people milling around. As the babies were only at 34 weeks they had SCBU cots and ventilators at the ready. At 10:29 pm, Sylvie Rose Ffion came out screaming. She weighed 4.10lbs. Two minutes later, Florence Lily Plum was born, also screaming, and with her legs tucked up under her like a frog (she was breech throughout the pregnancy). She weighed 4.13lbs. Thankfully the girls were breathing fine by themselves and were able to maintain their body temperatures. Everyone at Kingston Hospital was brilliant, we were given our own room for four nights during which my husband was allowed to stay at all times. 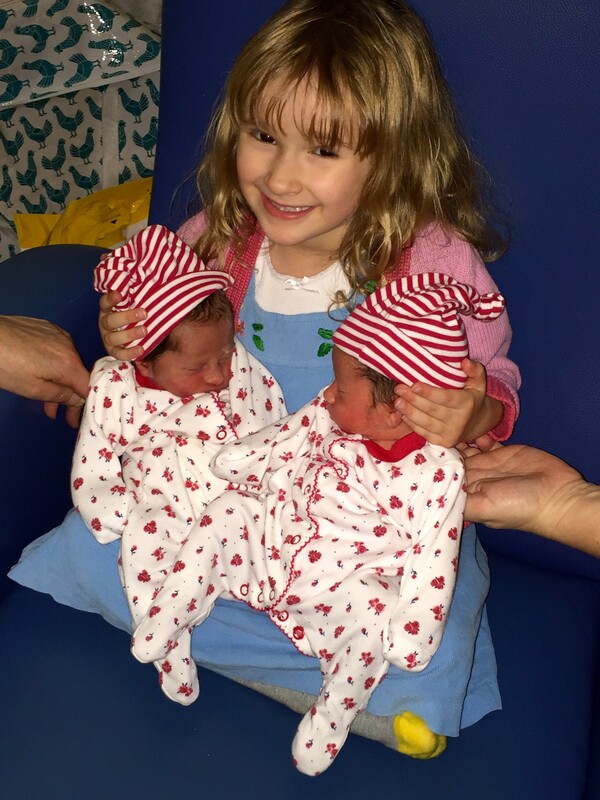 The babies did great, big sister Ava was thrilled, and the recovery from the C-section wasn’t too bad (apart from the terrible and painful wind! Ask for peppermint!!) My husband was given the whole of December off by his company, and it ended up being a very happy Christmas!